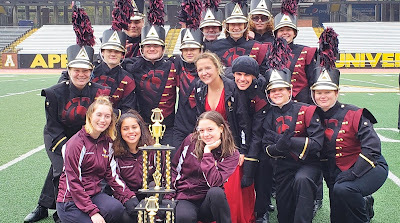 Fall 2019 Marching Band Colorguard Training and Tryouts! All students will be taught dance and flag technique. An evaluation will be done on the last day to decide our 2019 squad. If you enjoy dance and choreography and are looking to become part of a competitive performing group, then this is just right for you! Students selected will become part of our Spartan Sound Marching Band, which attends all Home and several Away varsity football games, as well as numerous competitions and community parades during the Fall season. 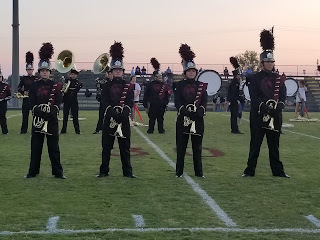 Click on the Spartan Sound 2019 tab to view the summer and fall rehearsal schedule and performances. Once school begins colorguard rehearses Monday, Tuesday, and Thursday evenings. Additional obligations include Friday football games and Saturday competitions from mid-September until early November. The Kick-Off meeting for our Spartan Sound 2019 season was held on March 25th. If you were unable to attend the meeting, please click on the Spartan Sound 2019 tab for access to the PowerPoint presentation, forms, and schedule for this spring, summer, and Fall. Contact Mr. Reynolds with any questions. Congratulations to Lynslie Higgs on here selection to the North Carolina All State Band. Lynslie placed 6th chair flute out of the 24 student students who auditioned for 10 seats in the honor band. Lynslie will participate in the All State Honor Band clinic and concert on May 3-5 at UNC-Greensboro. Congratulations to the following musicians on their selection to the South Central District Honor Band. These students competed against students from 10 other counties and will participate in the district honor band clinic on January 25th and 26th at Stuart Cramer High. Alternates are also listed, but will only attend the clinic if another student from that section is unable to go. Congratulations to all these students on their achievements! On Saturday, October 27 our Spartan Sound marching band traveled over two hours to compete in the Appalachian State University Festival of Bands marching band competition. Temperatures hovered in the low 40s all day, and there was a pretty steady drizzle of rain throughout the day as well. None of this seemed to bother the students, who put on their strongest performance of the season. 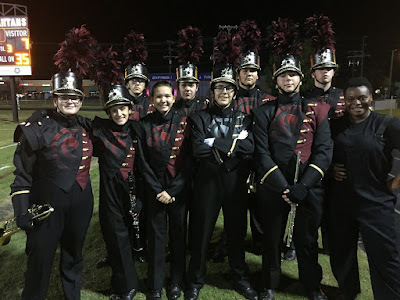 The marching band will continue to support our football team at games until the end of the season, and will also participate in both the Monroe and Indian Trail Christmas Parades. We are also pleased to announce that the Spartan Sound has been selected to march in the New York City St. Patrick's Day Parade in March 2019. This year marked the presentation of the first, and what will become annual, Andy Damery Memorial Scholarship. This $1000 scholarship is given to a Sun Valley High School Band senior to be used for higher learning educational expenses. The scholarship is given in honor of Andy Damery, a 2003 Sun Valley graduate and percussionist with the band program who passed away unexpectedly in January 2016 due to an undetected heart defect. This annual scholarship is presented to a senior band member who epitomizes Andy's passion for music and love of performing. Students were asked to submit an essay describing how music has played a role in their life and how they intend to keep music alive in their life after high school. This year's Andy Damery Memorial Scholarship winner is Joe Bulla, a saxophone player. Joe plays the alto sax in the concert band and tenor sax in the jazz ensemble. He will use the scholarship to assist with his studies in the fall at Appalachian State University. Joe Bulla (center) receiving the Andy Damery Memorial Scholarship. Assisting with the presentation is Andy's wife, and former flute/piccolo player, Cassie Damery, Andy's brother Logan, and his parents Beth Damery and Rod Damery.